We provide unique hearing solutions for attaining the best hearing levels. Hearing aid store in Velachery makes you feel home by its multi-lingual facility. The hearing care experts at hearing aid centre in Velachery are well versed in languages such as Tamil, English, Hindi and Malayalam. A patient focused hearing care outlet for providing best possible hearing health. We ensure to understand Patients need at first place. Providing high quality care and sharing adequate knowledge for probable cause and cure of hearing loss is our priority. Our strong relationships with customers have meant a lot to us. Honest hearing care practice has fetched us huge band of loyal customers. Our house visit service can be availed by residents of Chennai, in and around localities of Guindy, Velachery, Medavakkam, Thoraipakkam, Pallikaranai, Thiruvanmiyur, Palavakkam, Madipakkam and many more. 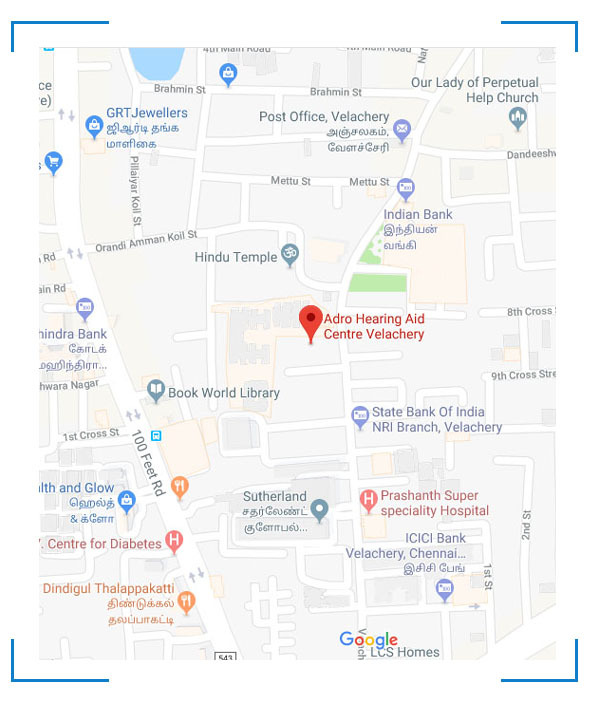 An extremely caring hearing aid centre in Velachery. Book your appointments now.